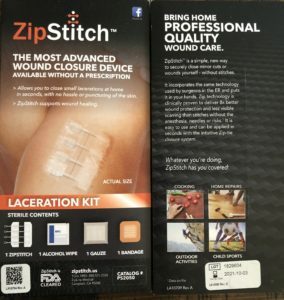 ZipStitch sent me their laceration kit.This is a great concept and has hospital grade technology for those who love the outdoors, have kids in sports, and so many other options. We put two in our cars for emergency kits. The parent company is ZipLine Medical and is a Silicon Valley-based company. ZipLine Medical was founded by a physician to address the clinical need for rapid, non-invasive and easy-to-use skin closure. The company has partnered with hospitals in 30 countries over the past five years to treat over a half a million patients. Each kit comes in a cardstock sleeve to make storing an containing your kit easy. In an emergency, the kit is very functional and easy to maneuver. The instructions are simple and easy to follow. 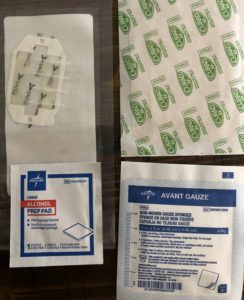 ZipStitch comes with Everything you need to treat and close a laceration (ZipStitch, Alcohol wipe, Gauze pad, Bandage). ZipStitch is 8 times stronger than stitches and can reduce scarring. It is made with hypoallergenic materials, FDA cleared and its technology has been clinically proven in over a dozen clinical studies to be safe. In reading about ZipStitch, there are No wound-related hospital readmissions, Fewer wound complications, No punctures that may allow bacteria into wound site, No latex and Made in the USA! The ZipStitch is a really neat concept. You secure either side of the zipstitch on both sides of a wound under 1.5″. It must be applied to dried skin for the adhesive to work. 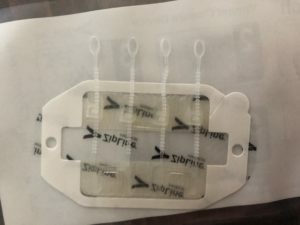 After secured you pull each of the tabs to close the wound, then snip the tabs ends off and cover with the large bandage. This is not waterproof so do not swim, soak, or put direct shower pressure on the device. The 4 zip strands give you the ability to customize the zipstitch to your wound. ZipStitch is $29.99. This is a relative bargain when you consider ER visits. However, I am not sure that I would use this in place of an ER visit. For Smaller wounds, this could easily help with loss of blood if you were out in the woods, or in a situation where you could not readily get to an urgent care or Emergency Room. This is promoted as a way to save a trip to the Emergency Room. In some cases when the injury is not severe, I can see that. They have a 30 day money back guarantee that is on a case by case basis. -Being prepared for emergencies is vital – Should you have a wound, this will help stop the bleeding until you can get somewhere for medical attention. Should it be a smaller wound, this might eliminate your need to go to the Emergency room. When in doubt, see a medical professional. -Range of motion – This kit provides a bit of give because there are 4 separate zip ties in the device. This allows you to adjust the closure on the wound. If the wound is on a joint this may limit the range of motion. -Length of use – if you follow instructions, the adhesive should last about 7 days. -Less scaring – With no needles, there could be much less scaring and pain. Stitches can have much more tension along the stitches, ZipStitch has less tension between each enclosure, and consistent tension along the entire length of the cut. There is also the fact that the cut is open for less time, so it heals faster. -Better than butterfly bandages and similar products. Those are essentially just tape and do not have the staying power that this laceration kit has. -Not able to use on all body parts (like the face, hands, feet, or scalp).